QuickBooks is an extraordinary piece of software. If you are reading this article, you may have used it some before or are beginning to use it. Either way, there are numerous ways to learn about QuickBooks. There are several free options to learn about QuickBooks and there are also a few options that cost money, some that are really worth the price and some that you may not need to spend money on yet. 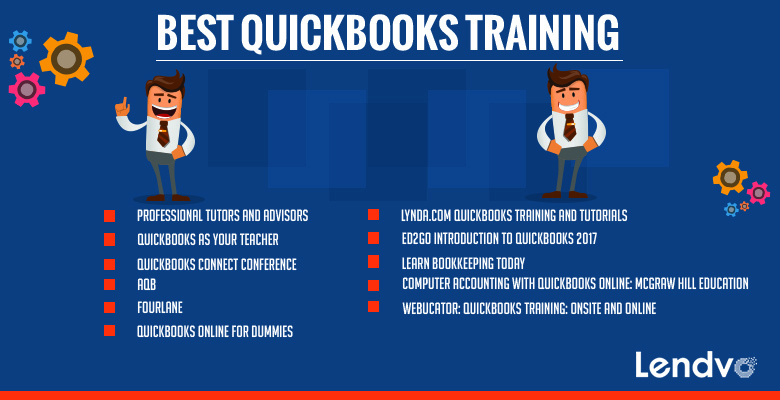 We will delve into some of the free options as well as some of the paid options for learning about how to use QuickBooks the fastest and most efficient way you can. The truth is you need to factor in your budget, time you have and how important the use of QuickBooks is for your small business. Accounting is usually important for a small business though so if you are the one in charge of tracking your expenses, QuickBooks is the best method to do so. There are a lot of professional advisors and tutors available get help from at the beginning of the migration process from either excel, intuit or whatever other accounting services you were using before that can help you in the beginning and as you move along. This will of course be at a cost so it is up to you to choose if you want to use a personal tutor or QuickBooks specialist in your area that you find through the Intuit website or somewhere else. Intuit provides an online accountant matching service called ProAdvisor. This is a reputable service and can provide local referrals based on your zip codes to match you with a trusted financial professional. ProAdvisor is an accounting pro who offers insights to drive small business success. Intuit tutors come in at about $100 per hour and other tutors are probably within the same range. Speaking with an advisor can help you with a number of things including going over your business structure, how to properly track expenses as well as going back and making sure all expenses you are including from the past are listed. This means going through each bank account from beginning to ending balance and tracking all of the expenses. All accounts that you have with a beginning and an ending balance, credit cards, loans and lines of credit should be accounted for and gone over with the professional of your choice. From the beginning, you should back up QuickBooks so you save yourself the stress once tax season arrives. QuickBooks has a lot of resources on its website to help you learn the ins and outs of the software. There is a very handy ‘help’ section on the website that you can use to ask questions and learn information about different pages on the website. There are a lot of video tutorials on the QuickBooks website that can teach you specific functions and give you a real overview of the software. Creating Invoices, Writing Checks, Inventory Models, seeing the Health of your Business, Time Tracking Invoices and How to Set Up and use QuickBooks Payments are all examples of tutorial videos on the websites. Intuit also offers QuickBooks training classes and certifications you can acquire. The QuickBooks Connect conference takes place in San Jose, California in the fall of 2017. In the past there have been over 4000 employees from Intuit at the QuickBooks conference along with many stars, celebrities and high-profile entrepreneurs. This year should have the best line-up yet as QuickBooks keeps on growing. This is a crash course on all there is to learn about QuickBooks. This is also a good way to grow small businesses because accountants and small business owners can connect and brainstorm business ideas. This could be the investment you and your small business needs to help propel you into a more successful future. The Main Day & Finale fee for this is $129. AQB is an online resource that lets beginners learn about QuickBooks through video tutorials. You do not have to register for the course itself, but if you want to participate in the quizzes and tests about your understanding of the course, then you have to register. This program is run my Michael Row and he is known as the expert of QuickBooks, running it for his own business and educating his clients about the details of it. Michael Row is a one-stop shop for QuickBooks users as he provides personal advice, solutions and consulting for his clients in all areas of QuickBooks. Fourlane is another educational resource for learning about the ins and outs of QuickBooks. Once you buy QuickBooks, you can get 24/7 access to the downloadable purchases that exist within FourLane through your Intuit account. FourLane basically acts as an extension to QuickBooks and is the top Intuit Premier Reseller and Consulting Firm in the world. They have performed thousands of client engagements with a variety of different clients throughout the world. They are an integral part of Intuit’s reseller group. They also offer courses on manufacturing and importing data, vendors and purchasing, sales workflow, customers, banking and credit cards, importing list data and file setup. Their QuickBooks Training service allows you to become a QuickBooks Desktop Expert for $14/95 per month. The annual subscription is $99.95. This includes on-demand access to over 20 hours of training content. The expert instruction comes from experts who have worked with more than 10,000 QuickBooks customers in the past. Their training courses allow you to track your progress and test your skills across multiple devices including desktop, laptops, ipads and phones. Training courses include QuickBooks Customers, Quickbooks Sales Workflow, QuickBooks Vendors & Purchasing, QuickBooks File Set Up, QuickBooks Chart of Accounts, QuickBooks Banking & Credit Cards among others. QuickBooks Online for Dummies is available on Amazon for almost $20. This new edition provides cut and dry advice on how to use QuickBooks from creating invoices and memos to managing inventory. The goal of the book is to give any person with a computer the ability to use QuickBooks online. These writers and creators of this book pride themselves on being able to teach anyone to securely organize their finances into one place, track inventory, figure job costs and create reports for business monitoring. Lynda.Com from LinkedIn provides resources to learn about small business accounting through QuickBooks. The resources through QuickBooks help to learn about QuickBooks through explaining the main features such as Setting up a Company File In Depth, Payroll Essential Training. The basic plan begins at $19.99 and the premium plan begins at $29.99. The learning is unlimited from 5,963 courses under both plans. You can watch on your computer, phone tablet or TV and cancel anytime while the first 10 days are free under both plans. You can take programs with the quizzes, project files to practice what you learn and view tutorials online when you are on the go. TeachUComp is an educational resource used mostly for online training that provides comprehensive video lessons and computer software training for professionals. TeachUComp is registered with the National Association of State Board of Accountancy as a sport of continuing professional education on the National Registry of CPE Sponsors. TeachUComp, Inc. is also an Approved Continuing Education Provider for Enrolled Agents and Other Tax Return Preparers. They are known for providing respected professionals information through stunning HD video lessons with crystal-clear audio. Their manuals are searchable for topics along with printable course transcripts and instruction manuals. In the package you will find printable instructional manuals and practice exercises for those who are new to QuickBooks; yet, many of the lessons they offer can also be beneficial to experienced QuickBooks users. The programs focus on QuickBooks use for Windows or MAC users and also come with PDF instruction manuals. There are also hands-on practice exercises that come with the tutorials to help you test your skills based on the videos you are watching. TeachUComp can be purchased online for just under $20. The program will show you each function prepared just like you were there with your instructor. You will learn to create custom reports, reconcile your accounts, use estimating, time tracking and more. The online course offers the same thing their two-day course offers with the most flexibility and value. Udemy is an online provider of education resources and this amazing offer is now available for $10 down from $100 for the LearnFest sale with a 30-Day Money-Back Guarantee. This program comes with 7.5 hours on-demand video, 1 article, lifetime access on mobile and TV in addition to a Certificate of Completion once you finish the course to have for yourself or show to a future employer. This program will give you the knowledge you need to operate QuickBooks 2017 for the desktop version, but not the online version. The course was created for the PC not the Mac although the Mac does have some similar features. This will give you complete control of accounting and bookkeeping needs by customizing the work how you want to. It will allow you to create your company’s books in QuickBooks and create analytics so you can summarize your business data and increase your production in the future. This will teach you how to create accurate bookkeeping documents like statements, deposits, invoices and estimates. It will also help you to understand financial reports and go over bank statements. You will also learn to create Profit and Loss statements. Once you complete this program you will have the core fundamentals you need as a freelancer or small business owner. This program was created for small business owners without accounting training. Ed2Go is an educational website that offers a course for $149 that takes 12 lessons and 24 total hours to complete to learn the ins and outs of QuickBooks. This comes with a syllabus, requirements, and an instructor and will help you manage the financial aspects of your small business. You will gain experience on the tools you need for the latest version of QuickBooks whether or not you have used another version of QuickBooks in the past. They will go over the ins and outs of invoices, accounting, writing checks, invoices etc. Paradigm has been an education provider giving the solutions to build and deliver in unique courses to further student’s career success. This program, unlike some of the others, focuses on the online version of QuickBooks 2017. This program will teach the accountant and non-accountant how to use Intuit’s QuickBooks online software. This is available as an EBook and comes with a complimentary 12-month version of the QuickBooks Online Plus software for students who purchase QuickBooks 2017 courseware. Students can study anywhere and any time and this will give all students the knowledge of accounting concepts and how to apply their skills through practice exercises. They will also learn what to do and why through a practical and effective building-block approach. This is a course available for online and desktop QuickBooks provided by a ProAdvisor certified by the BBB. The website aims to provide the training for business owners or bookkeepers to ensure all the transactions and functions are done properly. AJ made these to help small business owners make better choices when using QuickBooks. The first course is QuickBooks Desktop for Pro, Premier or Enterprise. This usually works for Windows or Mac. Then the QuickBooks Online course he teaches is a cloud-hosted version that you login to from a web browser. This is a book published by McGraw Hill Education by the textbook author Carol Yacht. She is a regular contributor to journals and author of Microsoft Office Accounting, QuickBooks and Excel textbooks. Susan Crosson is her co-author and is a Professor and Coordinator of Accounting at Sante Fe Community College amongst other things. The textbook covers all of the ins and outs about QuickBooks including payroll, online, invoices, statements, deposits, invoices, organization of expenses, controlling your cash flow, automated spending, reporting, taxes, invoices and so forth. Webucator offers customized in-person QuickBooks training for private groups or a public online QuickBooks class you can join. This is very unique, as the onsite courses will tailor the class to your needs including a Pre-Class Planning call with the instructor to review content, class logistics and your goals. Free retakes are offered as well as flexible scheduling so you can choose the dates and times that work for you. Post-Class support includes emailing questions to an instructor any time after the class is over. The live online training courses are offered over two day periods with expert instructors for $490 while the customized onsite training is customized content for groups of 5 or more people offered online or in-location with expert teachers. All the classes cover fundamentals of using QuickBooks 2017 and focuses on QuickBooks for PC users, not Mac. After the course, you will be comfortable using QuickBooks workspace and all its shortcuts, menus and icons. This will teach you the QuickBooks Features you need to know to enter and pay bills as well as run reports and make credit card transactions. The entire course will also give you the education to create new vendors, service items, inventory items and customers. Entering and paying bills will be second nature by the time you are finished. So, the novelty of being able to have your course self-catered to you must be balanced with the fact that there is no cancelation if the enrollment is low. Students rated trainers a 9.38 out of 10 and that is 18,148 students in total who have used the program. Additionally there are 15,603 Organizations who use and trust Educator for their training. They claim the satisfaction guarantee is 100% that makes it worth the pretty penny! There is in fact a Webucator Guarantee which they say has forced them to set the bar very high and make a commitment to always make sure they are improving the quality of their training. The Customer Enterprise Solution includes partner-level pricing, account management, reporting and reinforcement training and support. You will stay close with your team during the process if that is the route you have chosen and you can help one another answer questions with your professor. They also have a Classes Never Cancel for Low Enrollment policy and risk Free Policy not offering your money back, but at least offering to give you a full course refund for another course if you are unhappy. The complimentary trainer meetings are part of what really makes this a sell for us.